Volunteer on two race days and grab your venue shirt. Support us three times on a race day and you will get your support beanie. Volunteer on four race days and we will say thank you with our special hoodie – not available for purchase! If you have any question and didn’t find an answer in our FAQ, the Volunteer Coordinator can be reached at helfer@spartanraceeurope.com. Just make sure to include the race location you are interested in when you email. NOTICE: They are only limited registrations available on NON-race days. Join our team as a volunteer in our races in Germany or Austria. Options to volunteer from Wednesdays to Sundays after the race. 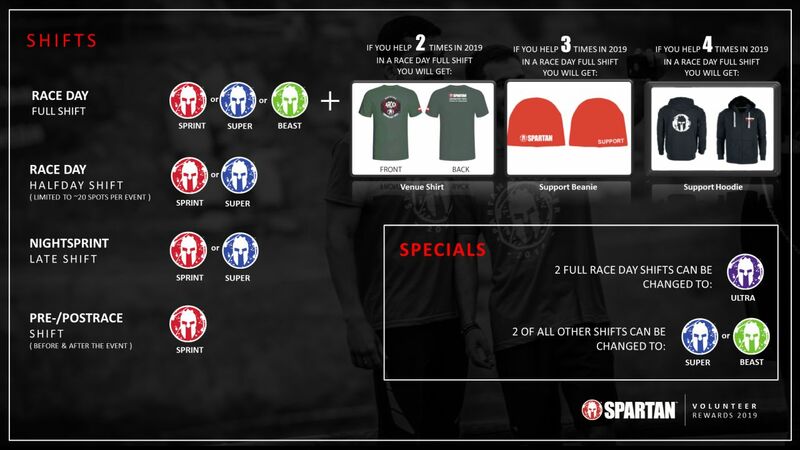 Get a free entry for a Spartan Race of your choice in Germany or Austria.